You may have been into or heard of Hot Yoga. It is Yoga that is performed in high temperatures, between 37 and 40 degrees Celsius. While we may not be experts in Hot Yoga, we are certainly specialists in giving the right advice about the best heating solutions needed for specific conditions as such. 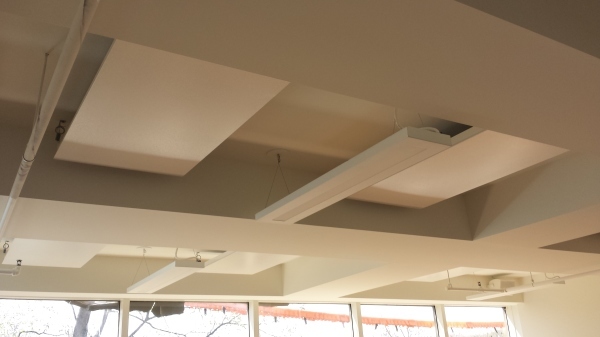 When approached by Victoria Park’s administration, they explained to us that they wanted to build a Hot Yoga studio and that they were looking for an efficient way to heat the space quickly to a 38 degrees temperature, yet the heat would have to remain consistent throughout the studio, with no air circulating, in order to maintain a healthy and clean environment for their users. Having understood our Client’s needs for this project, we recommended a heating system based on a complete heat loss analysis which took into account all building parameters, from R-values of the building envelop to the building orientation and window sizes, in order to ensure that the system would not be over or under sized. In the particular case of a Hot Yoga studio project, other challenges may present themselves. Thanks to an open mindedness and to having users at the center of their focus, Victoria Park’s administration were open to our recommendations, which went beyond the number of heating panels to be installed, to include how to best insulate the studio, how to avoid thermal bridging and, of course, how to best calibrate and operate the system. Take a look at some pictures of this project below.